Got to love Facebook right, it is amazing the connections that are made from it. That Zuckerberg guy is so smart. Here is my fun FB connection story. So a woman post on her wall that she is needing some help to find someone who can make quilt block cookies. Then Kylie a friend of mine and skin care client sees her post. Kylie then is getting a chemical peel from me one day and we are chit chatting about my SweetHobby blog. She tells me about her FB friend who is looking for a cookie maker so I email her my blog address. Fast Forward a few weeks later and I get a call from the Laura, the FB friend of Kylie, and she says she has looked at my work and wonders if I could do some cookies for a crocheting class that her friend Cindy from Skip to my Lou is teaching at a craft bloggers conference in a week. I agree. First I was asked to do quilt block cookies that are found on this post made by the talents of Eat Emily and Amy's Treats. While Laura was talking to me she was unaware that Cindy had also found someone to make cookies at the same time so they asked me to do the balls of yarn and the other lady would do the quilt squares. My deadline was for Friday evening. I get a call Thursday morning, the morning my body decides to take a vacation, I was not feeling to hot. The call is from Laura, she informs me that the other lady got in a car accident and has broken her collar bone and of course there is no way she is going to be able to decorate cookies. Laura asks if I would be able to do an extra 2 dozen of cookies that are the quilt squares.......Confession time.....when it comes to baking or cooking I have a hard time saying no. I of course say oh yeah I can do that. Even though my body is saying umm no Natalie you can not. Well I got them done, stayed up a little late but hopefully the class went well and I hope the attendees enjoyed the cookies. 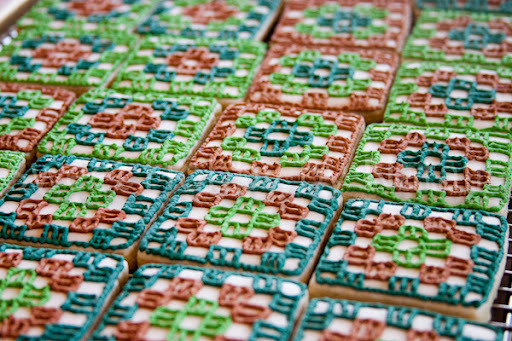 The quilt square cookies on a almond sugar cookie. 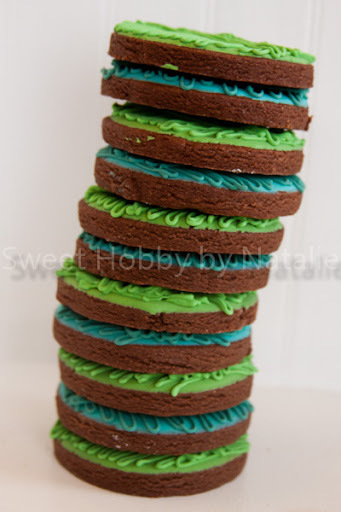 The balls of yarn are coconut flavored icing on a yummy chocolate sugar cookie. These were pretty simple to make. 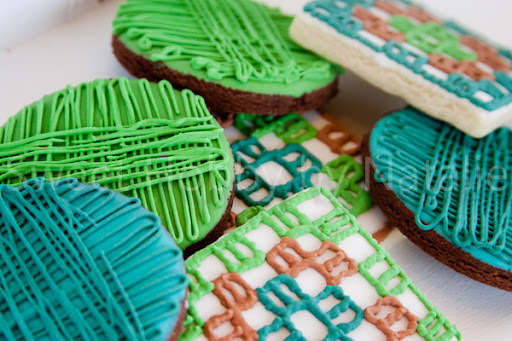 If you want to make the Granny Square Cookies, Eat Emily and Amy's Treats has a little tutorial. 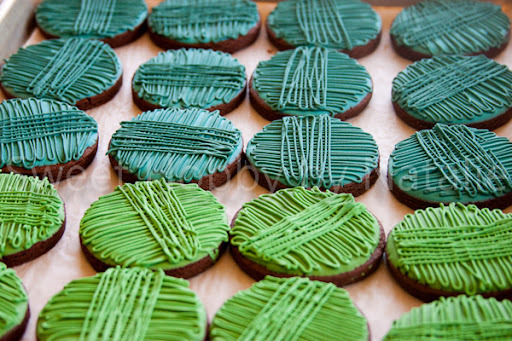 Those are way cute, my type of cookies! So if you had any extra, you can just give them to me for my b-day and call it good. You know, take one thing (out of many) off your plate!